This summer, visitors can explore 13 whimsical garden follies displayed throughout the estate for Winterthur’s first garden exhibition and enjoy the awe-inspiring fountain display at Longwood Gardens using just one admission ticket. From June 4 to August 31, visitors will be delighted by two glorious du Pont gardens, located only minutes apart in the historic Brandywine Valley just outside of Philadelphia. For $34, visitors can see both Longwood Gardens and Winterthur, as well as take a guided tour of the Winterthur mansion, at a 20% saving. From the 22-foot tall Needle’s Eye floating in a pond to the Chinese Pavilion, from the pagoda-topped Latimeria Summerhouse to the Faerie Cottage with a thatched roof, Winterthur’s first garden exhibition, Follies: Architectural Whimsy in the Garden* will delight visitors this summer. Thirteen fantastic structures are located throughout the estate for visitors to explore and enjoy. A folly is an architectural construction, such as a gazebo or summerhouse, often extravagant or picturesque, placed within the landscape to amuse, frame a view, or pique curiosity. Some of the follies at Winterthur are newly built structures based on classic and contemporary examples at estates elsewhere. These include the Gothic Tower, inspired by sham castles and fake ruins that were very popular in European landscapes in the 1700s and 1800s. Others, such as the Latimeria Summerhouse, are historic structures currently in the garden that visitors have enjoyed for years. Together they form a delightful, entertaining, and fresh way for visitors to discover and experience the Winterthur Garden. The Follies exhibition can be enjoyed on foot or from the garden tram. A one-mile walking loop takes approximately 45 minutes at a leisurely pace. The main path through the garden is wheelchair and stroller accessible. During the exhibition, the garden will be open until dusk. 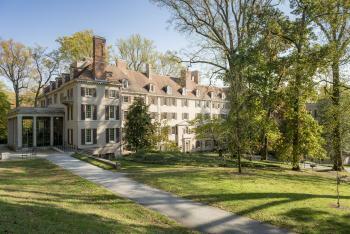 All admission tickets include Enchanted Woods, a three-acre garden for children, and an introductory tour of the mansion. Longwood Gardens is not only one of the world’s great display gardens but is also home to the most significant fountain collection in North America. The jewel of the fountain collection is the Main Fountain Garden. The culmination of the legacy and vision of Longwood founder Pierre S. du Pont, the Main Fountain Garden combines classic landscape design with stunning architecture, innovative technology, and extraordinary fountains. A hallmark of the Longwood experience since its debut in 1931, the Main Fountain Garden completed an extensive two-year revitalization in 2017. 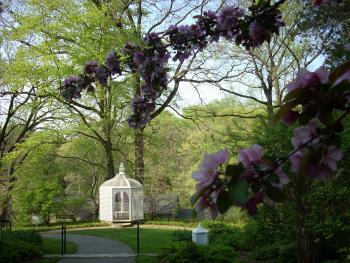 Today, guests can experience the 5-acre garden’s generous lawns, shaded alleés, sculpted plantings, and explore its unique garden follies, including the hidden Grotto, elaborate sculptures, and Love Temple in the adjacent Carpinus Allée. The dazzling fountain performances are a feat of design and engineering that combine the garden’s original fountain features with a new suite of awe-inspiring effects, including 1,719 swirling jets that can reach as high as 175 feet and 30 jets that combine water and flame. The fountains perform 12-minute shows set to music daily at 11:15 am, 1:15, 3:15, 5:15, and 7:15 pm through October 28. On Thursday through Saturday evenings spectacular 30-minute illuminated performances set to a variety of musical genres delight at 9:15 pm May–July and at 8:15 pm August–October. In addition to the Main Fountain Garden, Longwood is also home to the enchanting Italian Water Garden and Open-Air Theatre fountains, which also perform daily. 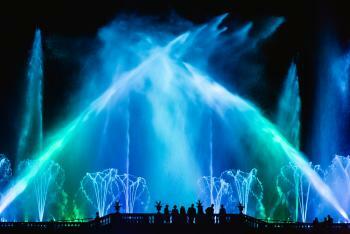 For a compl ete schedule of all fountain performances, garden features, and programs, visit longwoodgardens.org. “Follies and Fountains” tickets may be purchased on-site at Winterthur and Longwood Gardens, or their websites, winterthur.org or longwoodgardens.org. 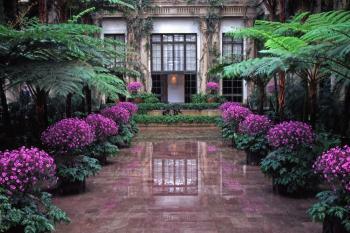 *Follies: Architectural Whimsy in the Garden is presented by DuPont and The Estate of Mrs. Samuel M. V. Hamilton.